A lot is going to happen in the heavens this year. 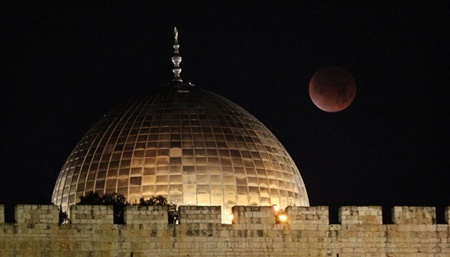 In 2014, the first of 4 total lunar eclipses occurs on Passover (First Feast Day), April 15, 2014, followed by a solar eclipse on April 29, 2014, then the second total lunar eclipse occurs on the Feast of Succoth (Last Fall Feast Day), October 8, 2014, followed by another solar eclipse on October 23, 2014. You may have noticed I have already posted several stories on the subject of the blood moons. Could they truly be of prophetic significance? I believe they at least warrant paying attention to. -W.E. Mark Biltz, pastor of El Shaddai Ministries in Bonney Lake, WA, has discovered some information that is quite interesting in a prophetic sense. • So you also must be ready, because the Son of Man will come at an hour when you do not expect him. (Matthew 24:44). • Therefore keep watch, because you do not know the day or the hour. (Matthew 25:13). Immediately after the distress of those days the sun will be darkened, and the moon will not give its light; the stars will fall from the sky, and the heavenly bodies will be shaken. At that time the sign of the Son of Man will appear in the sky, and all the nations of the earth will mourn. They will see the Son of Man coming on the clouds of the sky, with power and great glory. Of course, some might contend that I am assuming a couple of theological issues, and I am. Among other things, an understanding of Daniel's 70th Week is essential to understanding that we can not be in the tribulation now given there has been no confirmation of a covenant nor has there been a Rapture. I can concede that the tribulation and Daniel's 70th Week do not necessarily have to be entirely in sync, but that does not help with the problem at hand. I have included links to both of those topics, Reasons for a Pre-Trib Rapture and Daniel's 70th Week, at the end of this article if you want to study either of those topics further. their words to the ends of the world"